Corra uair tha Stòrlann a’ gabhail phròiseactan os làimh do bhuidhnean eile agus tha a’ bhuidheann air stuthan a dheasachadh san dòigh seo do dh’inbhich a tha ag ionnsachadh na Gàidhlig. Chaidh an goireas eadar-chuspaireil seo a chruthachadh airson taic a thoirt do luchd-teagaisg an cuspair seo a lìbhrigeadh le clasaichean 4-7 sa bhun-sgoil. Tha planaichean agus goireasan feumail ann a tha a’ ceangal ris na cuspairean a leanas: A’ planadh Cuspair, Aig an Dachaigh, Fògradh Chloinne, Anne Frank, Am Blitz, Prìosanaich Cogaidh, Obair nam Mnathan, Latha a’ Chuimhneachaidh. Feuch gun toir sibh sùil air làrach-lìn Fileanta – an cruinneachadh ùr de stuthan a tha freagarrach airson N4/5 Gàidhlig a theagasg. Tha stuthan air a dhol air-loidhne an-diugh, tuilleadh ri dhol air-loidhne ro dheireadh an Lùnastail agus na stuthan a leanas thairis air an ath teirm no dhà! Pasgan air Gràmar/Cànan airson Ìrean N4 agus 5. 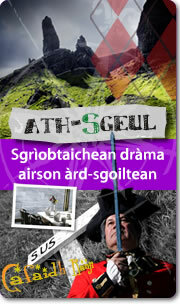 Cuimhnichibh cuideachd… post-d gu oifis@storlann.co.uk ma tha ceistean sam bith agaibh mun chruinneachadh! 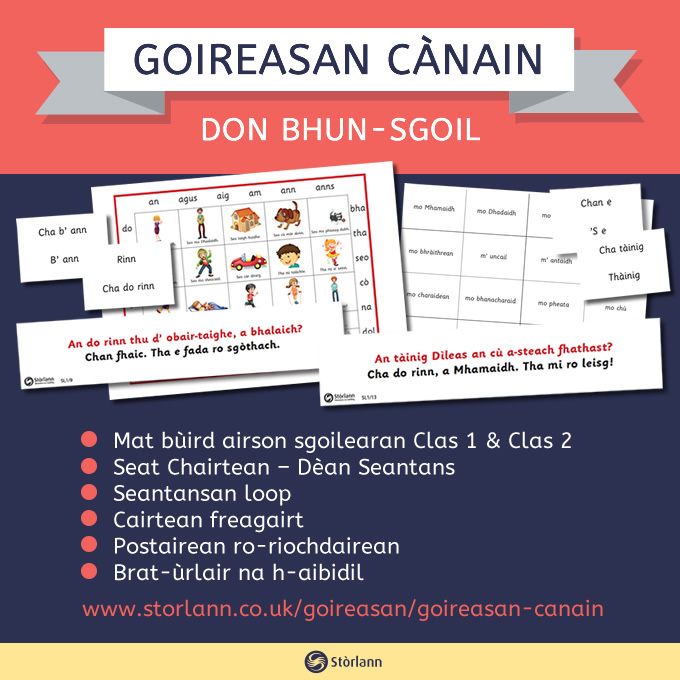 Chaidh Frèam Cànain a dhealbh gus structar a thoirt do ionnsachadh na Gàidhlig le sgoilearan ann am Foghlam tro Mheadhan na Gàidhlig aig nach eil i mar chiad chànan. Tha e a’ gabhail a-steach gach ìre o sgoil-àraich gu àrd-sgoil. 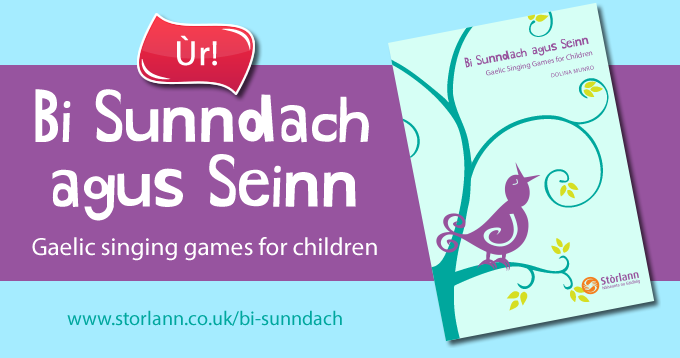 Chaidh ullachadh air iarrtas, agus le taic, thidsearan bun-sgoile is àrd-sgoile. Tha Stòrlann air taic a thoirt do IntoFilm le goireasan foghlaim ùra Gàidhlig a tha stèidhte air an fhilm ‘Seachd: The Inaccessible Pinnacle’. 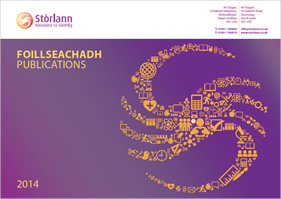 Am measg nan goireasan tha notaichean an tidseir, taisbeanaidhean PowerPoint anns a bheil cliopaichean bhon fhilm, agus duilleagan-obrach, ann an Gàidhlig agus Beurla. 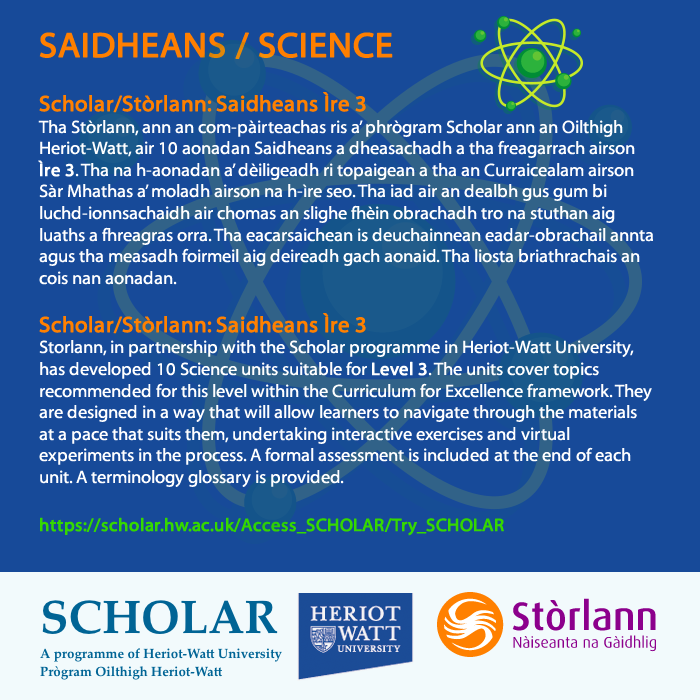 Faodar goireas na h-Àrd-sgoile a chleachdadh cuideachd airson luchd-ionnsachaidh ullachadh gus Seachd a chleachdadh mar theacsa ann am measaidhean nàiseanta ’s iad a’ dol a-steach dhan Ìre as Àirde. ’S e Daydream Education a dh’fhoillsich na postairean seo ann am Beurla mar ghoireas teagaisg do thidsearan Eòlas Corporra agus bha Stòrlann Nàiseanta na Gàidhlig uabhasach toilichte cead fhaighinn am foillseachadh ann an Gàidhlig. Tha iad stèidhichte air cuspairean a tha nam pàirt den churraicealam airson Eòlas Corporra sa bhun-sgoil agus san àrd-sgoil. Tha iad air an dealbh le ìomhaighean agus grafaigean a tha dathach, tarraingeach, agus chan eil teagamh nach cuidich iad le ionnsachadh agus le bhith a’ brosnachadh ùidh na cloinne, chan ann a-mhàin ann an Eòlas Corporra ach, cuideachd, ann an Slàinte is Sunnd. Tha Stòrlann air am foillseachadh ann an dà mheudachd, A2 agus A3. Tha na postairean A2 gu sònraichte freagarrach airson a bhith gan cleachdadh san gym agus bidh an fheadhainn nas lugha freagarrach airson an taisbeanadh sa chlasrum agus air ballaichean trannsaichean na sgoile. Tha sinn gu mòr an dòchas gun còrd an goireas ris na tidsearan agus ris na sgoilearan agaibh. 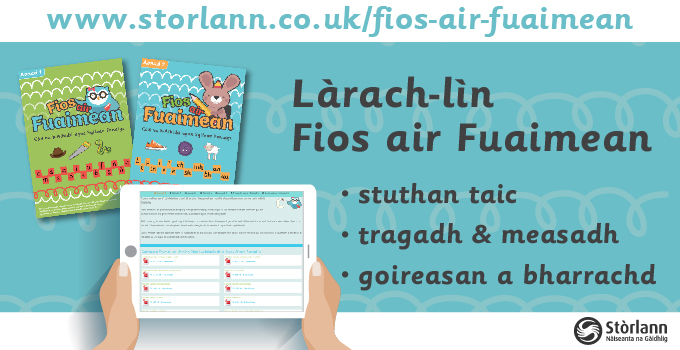 Tha Stòrlann a’ cur fàilte air beachdan no iarrtasan bho thidsearan no sgoilearan; gabhaidh fios a chur thugainn uair sam bith aig oifis@storlann.co.uk no air 01851 700 880. Le còrr is 33,000 clàran air-loidhne (21,705 dhiubh anns a’ Ghàidhlig) air iomadach cuspair co-cheangailte ri dualchas na h-Alba, ’s e goireas air leth a th’ ann an Tobar an Dualchais a dh’fhaodadh a bhith feumail aig diofar ìrean den sgoil. Tha na clàran, a chaidh a thogail bho na 1930an gu 2005, a’ tighinn bho trì chruinneachaidhean: Tasglann Sgoil Eòlais na h-Alba (Oilthigh Dhùn Èideann); Cruinneachadh Chanaigh agus BBC Alba. 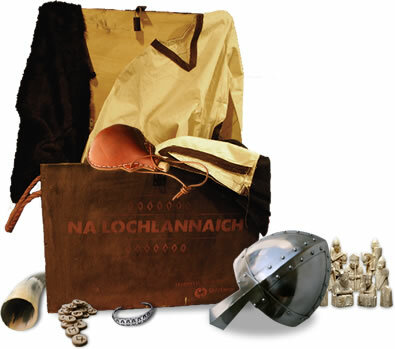 Nam measg tha sgeulachdan, òrain, ceòl, bàrdachd agus fiosrachadh de gach seòrsa. Tha Giglets Gaidhlig uaireannan ainmeil agus uaireannan nan leabhraichean clasaigeach an ìmpis a dhol air dhìochuimhne, a tha air an ath-chruthachadh agus air an atharrachadh airson luchd-èisteachd an latha an-diugh. 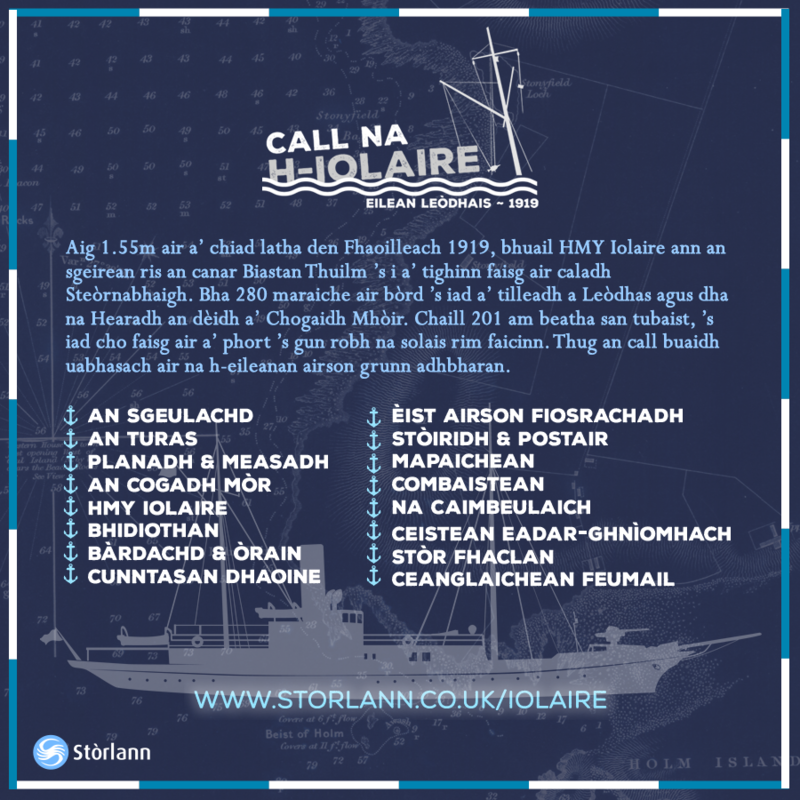 Cruinneachadh de chòrr is 30 teacsa a ghabhas cleachdadh ann an obair Leughaidh Cho-roinnte agus Sgrìobhaidh Cho-roinnte aig ceann shuas na bun-sgoile agus ceann shìos na h-àrd-sgoile. 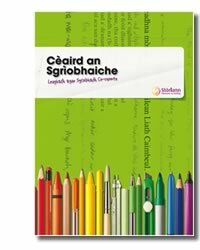 Tha na teacsaichean anns an leabhar ann an ceithir roinnean: neo-fhicsean, ficsean, bàrdachd agus sgeulachdan à beul-aithris na Gàidhlig. 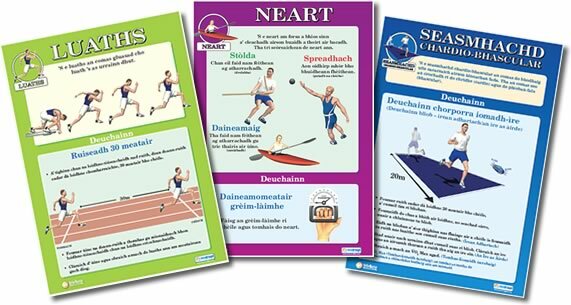 Tha cùl-sgeul a’ mìneachadh cò às a thàinig an earrann, beagan mun t-seòrsa sgrìobhaidh agus fiosrachadh mun ùghdar. ’S e taghadh de sgeulachdan goirid ùra, tarraingeach a tha seo bho sgrìobhadairean ùra mar Caron NicFhionghain agus Daibhidh Màrtainn, agus bho sgrìobhadairean eòlach mar Dòmhnall Iain MacÌomhair. Bheir na sgeulachdan seo an leughadair air thuras bho eu-dòchas gu dòchas, eadar Alba agus Haiti agus bho ghruamachd gu aoibhneas. Tha còrr is mìle bliadhna bhon a dh'fhairich Alba smachd nan Lochlannach. Aig an àm sin, chaidh an ainmeachadh mar dhaoine cumhachdach, feargach agus eagallach. Mìle bliadhna air adhart 's chan eil dealbh slàn againn fhathast de na Lochlannaich. Tha Fo Bhruid agus feadhainn de na sgeulachdan goirid à Eadar dà Sgeul againn a-nis nam faidhleachan claisneach so-luchdaichte no sruthach. Tha cuid dhiubh air an leughadh leis na h-ùghdarran fhèin. 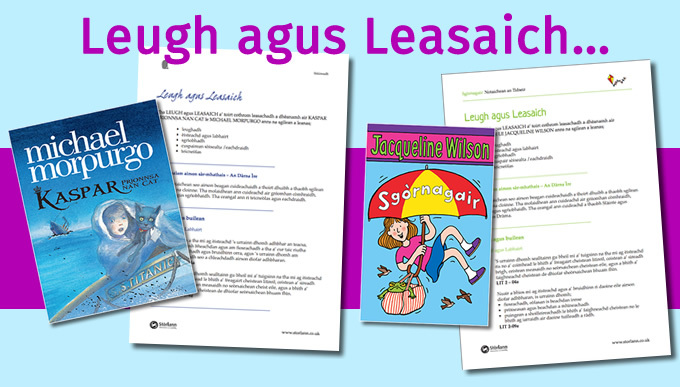 Tha leabhraichean-d a-nis rim faighinn airson Leughadairean-d agus innealan Kindle. 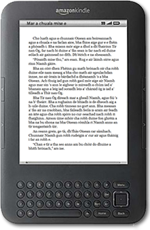 Gabhaidh Kindle airson PC a luchdachadh a-nuas.